Make and Print a Mini-Comic in a Day! 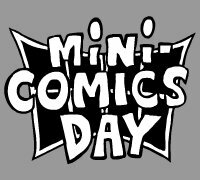 Join 7000 BC as we host the second annual Mini-Comics Day, an international celebration of the art of cartooning and creating hand-made comic books. On Mini-Comics Day, participating cartoonists (this means YOU!) will write, draw, and print copies of their own mini-comics. Wildly varying in both form and content, mini-comics are a wonderful synthesis of cartooning and hand-made art objects. This is a FREE event and everyone is welcome! Comics creators from 7000 BC will will be on hand throughout the event to answer questions and give guidance. We'll provide some art supplies, or bring your own. We'll even help you print, fold and staple your mini-comics as you complete them. Bring your papers, pens, and imaginations! 1:00-2:00 pm - For those who would like some guidance, a short lesson on making mini-comics and comics in general will be presented by 7000 BC. 1:00-5:00 pm - Make your minis! Comics, mini-comics, and books by 7000 BC creators will also be available. Sponsored by Page One Books, and 7000 BC - independent comics from New Mexico! Page One Books is located at 11018 Montgomery Blvd NE, Albuquerque, the SW corner of Montgomery and Juan Tabo.